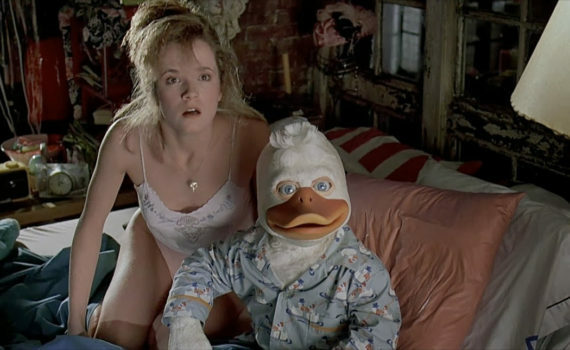 Howard the Duck is an insane melting of the best parts of Ghostbusters and Teenage Mutant Ninja Turtles into something resembling sci-fi but ultimately becoming a cult classic that has literally never been duplicated. You wouldn’t want it to be duplicated, honestly, both because you can’t work the same magic twice and you can’t imagine watching it all again. It’s an event that everyone should attend once, the viewing of this movie, like a right of passage to adulthood. Once you’ve seen humanoid breasts on ducks from another planet, your life will never be the same, and who wouldn’t want that sort of change to their world view. Howard is something just crazy enough to work, just once, just barely, destined to always be less understood than it is loved. Sucked straight out of his living room by a laser beam he never saw coming, Howard the Duck finds himself on the streets on Cleveland without a friend in the world. Apparently, his planet was one in which ducks evolved into the dominant species, so Howard can walk, talk, smoke a cigar, and make whoopee just like any average Joe, if only someone would take him & his plight seriously. Luckily, he runs into a girl named Beverly, a sweet rocker who’s willing to take him home, and might turn out to be a human he could fall for. But there’s a small problem; the laser that could send Howard back can also bring in evil beings from far galaxies, beings bent on the destruction of Earth, humans & ducks & all. This is one of those movies that is almost impossible to describe or to relate; you’re just going to have to watch it to experience it. Tim Robbins as a mad scientist, a duck with a condom, Ed Rooney from Ferris Bueller turning into a dark lord from outer space; it’s as wacky as it sounds. But that’s also the wonder of this film, that they could watch a sci-fi flick like Ghostbusters and decide to turn the volume up one notch, to go overboard in a way that somehow works despite its insanity. To say that Howard is a cult classic is an understatement; it basically defines the genre and will instantly become something you either love or hate as soon as you see it. It’s hard to predict which way you’ll lean; you’ll just have to chance it and have a good time either way.